MLCS sells two different 20A paddle-type off switches. The “Router Table” version costs $30 and includes a male and female plug, while the “Motor” version costs $22 and needs to be hardwired. The switch works with 3-1/4 HP motors or less. I think it’ll work with a bloody stump, as well. Get universally crappy reviews as a product that’s not made that well. Is there anything like this out there with a magnetic switch instead? I have one mounted on my lathe to control my dust collector, over a year old and no problems. I’ve been looking for something like this for a while, my girlfriend’s father got an old old drill press for his birthday and it doesn’t have any kind of switch at all on it. 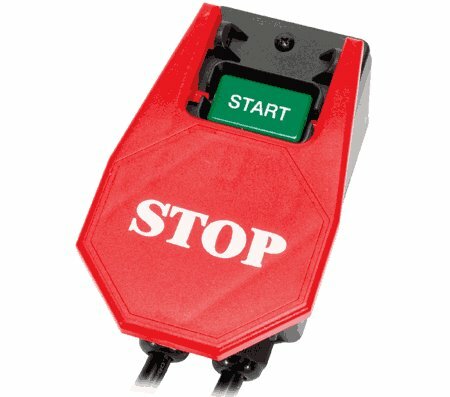 I want to install a switch with an emergency stop… just in case. The man’s already down to 9.5 fingers, he can’t afford to lose any more.